During the summer months, ripe, delicious apricots are always part of our fruit intake. After all, the rule at our house is eating a minimum of 5 fruits and vegetables a day. Apricots are superb dipped in dark chocolate with a cocoa content between 55%-64%. At that cocoa content range, you can still taste the full acidic sweetness of the dried apricots. Dried apricots are fantastic in bringing out the fruity flavor notes of chocolate. Turns out, the combination is a healthy one as well. Dried apricots are high in fiber and carotenoids plus as a bonus, you get the high antioxidant level of chocolate. Certainly you already knew this, but it good to read it once again that carotenoids are antioxidants which help to protect us against cancer, heart disease and bad cholesterol. When we entertain in the summertime, we often lean towards serving savory tarts with salads and cheeses. It’s easy since you can make most of it ahead of time and it has a picnic-French bistro style kind of feel to it. 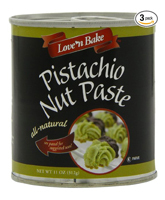 To finish the meal, I serve baked apricot tarts, sprinkled with some unsalted pistachios and a touch of cream. There simply explosive in the mouth. It’s the type of dessert that not that many people are familiar with. Perhaps turned off a little by the burned tips of the apricots, so everyone always asks for “A small piece for me-I’m so full….” Yet then everyone always asks for seconds…. 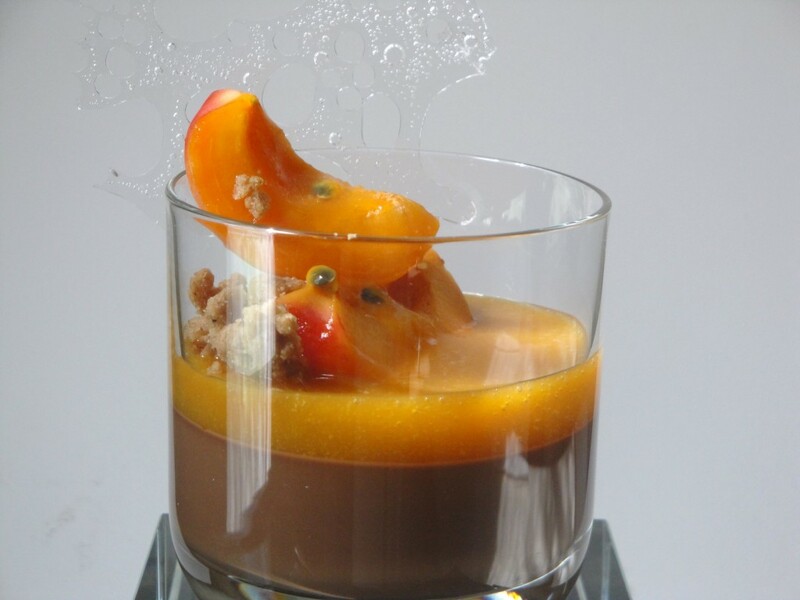 Silky, smooth chocolate crémeux with apricot coulis is simply explosive on the taste buds as well. For the recipe below it is important to use chocolate with the correct amount of cocoa content. Between 60% and 65% is good. If you go higher than those numbers, nuances of the apricot coulis may get lost. You do not want to use chocolate chips, regardless of their cocoa content. The low content of cocoa butter in chocolate chips will interfere with composing a smooth and creamy chocolate crémeux. Get started by making the crémeux and pour it in the glasses. You can do this a day ahead. To make it right, you will need a digital thermometer, if you do not have one, you will have to start by going to the store first! Place the crémeux well wrapped in the refrigerator since chocolate products easily absorb refrigerator scents. You can easily do this a day ahead. 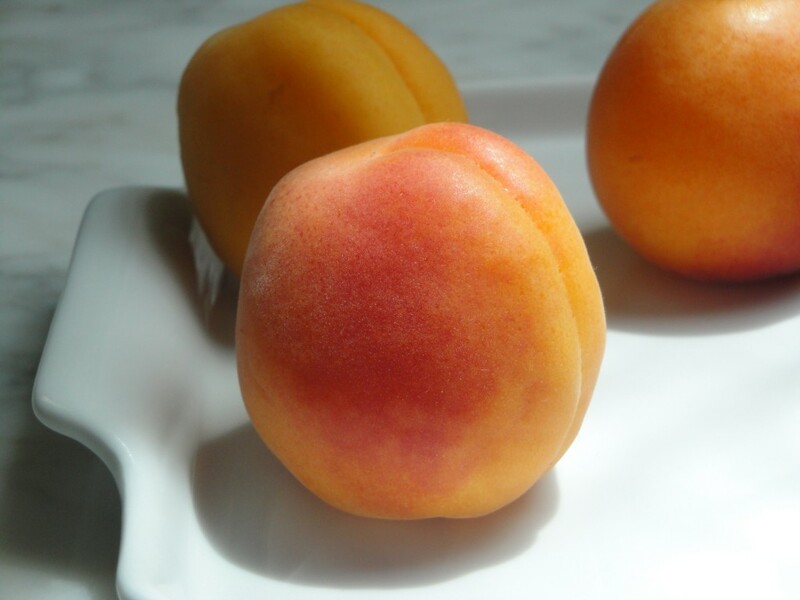 For the apricot coulis select ripe apricots and puree those until very smooth. Add more sugar if needed. For an extra dimension I always like to add a splash of Apricot liquor or Kirsch. You can also do this a day ahead and store in the refrigerator. The crumble is optional but very good if you like a touch of a crunch. Find the crumble recipe in the recipe archive at “Figs with Mascarpone”. Crumbling some butter cookies can also do the job. When you are ready to serve, spoon some apricot coulis on top of the crémeux, place some apricot quarters in the glass and sprinkle with some crumble topping. 1. Pay close attention to the method and temperatures or you will end up with a curdled mess! 2. Bring the cream, milk and about half of sugar to a boil in a small saucepan. Meanwhile in a bowl, whisk the egg yolk smooth and very rapidly whisk in the remaining sugar. Make sure no egg yolk and sugar lumps are still visible. 3. Pour a quarter of the boiling milk into the egg yolk mixture and whisk quickly. Pour the tempered egg mixture into the heated milk and on low heat stir the mixture to 183⁰F (81⁰C) while CONSTANTLY stirring using a rubber spatula. Remove from heat and pour into another bowl to stop the cooking process. 4. Add the chocolate and using an immersion blender or whisk make the mixture smooth. Pour into glasses and place covered in a refrigerator. Combine the apricots, sugar and liquor in a pitcher and blend smooth using an immersion blender. If the apricots are meaty and refuse to come to a puree, add some orange juice or water. Once smooth add the juice and seeds if desired from a passion fruit. Dit weekend zal ik dit zeker eens uitproberen. Looks wonderfully delicious! I am going to make this weekend for friends! I made this for my family and they were thoroughly impressed with the way the apricot coulis tasted with the dark chocolate. I did my best to present it like in the picture, but I think I will learn the secrets in the class I have with Chef Van Damme this upcoming semester. I’m excited to learn what he has to teach me and how it will broaden my culinary point of view. I made this dessert this past weekend for a brunch that I hosted at home and I have to tell you, it was a huge success. Now everyone wants the recipe. Please let me know if there will be a new recipe coming soon. I’m going to try this at home for my wife and see how she likes it. It’s different as far as mixing the apricots with chocolate, but I’m sure it’s both refreshing and delicious. I’ll get back with you to let you know how it came out, plan on making it this weekend. Really enjoyed the plated desserts class, and learned alot about presentation as well as a few baking secrets here and there. After i saw this recipe, i just had try making it. I d never tried a chocolate and apricot combination. At times certain recipes, require too many ingredients, but Chef Eddys recipe for this chocolate cremeux, Though very exotic, the ingredients were easy to get, and also the method for making it was easy to follow. But, i do have to confess… I curdled the cremeux the first time. I had a few friends over at my apartment when i made it. Yes!! it did take time, and they anxiously waited as I made it. they were super curious on how it would turn out!! I ll be trying more recipes posted on your website!! P.S. Why dont you open a DESSERT HOUSE, where i can go once in a while to PIG OUT!! I can’t wait to make this , thank you for posting creative and simple recipes we can make at home!! To me serving a dessert in glass or sauce on the side in a shot glass ca be made very elegent and fun. Cooking to this temperature ensures a food safe product. This is should be interesting. I can’t wait until tomorrow.